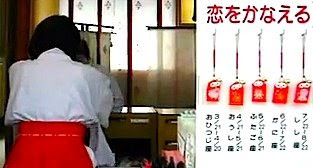 "The Master of Music, Gensho, who directed the music for festivals and ceremonies at Iwashimizu Shrine south of Kyoto, went to visit the shrine's holdings at Yoshikawa in Bitchu Province. On his return to the capital he stopped at Muro. While there he seemed about to die from a derangement of the spirit. Half the hair on his head turned as white as snow. Thinking this was something supernatural, he sought the help of a shaman. Speaking through this woman, the god of the Kibitsu Shrine said, "Although you frequently pass through this area, you never play your music for me. Therefore you are suffering in this way." Gensho quickly paid a visit to that shrine, and as he played the tunes secret to all but the emperor, his white hair returned to its normal color. One must say that he was a wonderful credit to his calling."